It looks like Watford scouts had a busy weekend in the North of Portugal. As covered by us earlier today, Hornets scouts have been spotted at Porto’s away game at Vitória Guimarães, which ended in a goalless draw. Not it turns out that Watford emissaries were already in that area for the weekend. 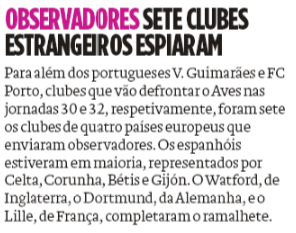 As reported by newspaper O Jogo, representatives had watched Aves playing Braga on Saturday night. 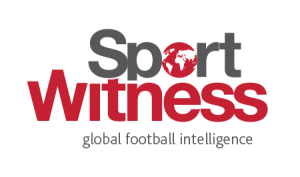 The Premier League side had the company of Celta Vigo, Deportivo La Coruña, Real Betis, Sporting Gijon, Borussia Dortmund and Lille in the list of scouts. After a goalless first half, Braga ended up scoring two goals at the start of the second half, and Aves couldn’t find a reaction. Aves goalkeeper Quentin Beunardeau had an impressive night stopping the home side from losing by a bigger margin, while for the away side, midfielders Dyego Sousa and Paulinho were the responsible for the great display. As Watford haven’t been linked to any Aves or Braga players lately, maybe they just took the chance to watch both games on the same weekend, as Aves’ and Vitória’s stadiums are just 10 miles away from each other.